Home » News » What Are Compression Springs? Here at James Spring, we take pride in the reputation we’ve earned as a manufacturer of specialized springs for almost every industry. Since we’ve been designing and manufacturing springs for more than half a century, we have made it our mission to provide our valued customers not only with high-quality springs, but with valuable information and helpful facts about the springs they use most. Today we’re excited to discuss one of our most popular products, compression springs! These powerful springs can come in a wide range of sizes and configurations, making them ideal for applications in many different industries, as well as many products that may surprise you. Before we get down to the nitty-gritty, we’ll start by explaining what makes these unique springs so special. Compression springs are open-coiled springs which are wound in a helical shape. If you can’t picture that, you can look at a tiny example of a compression spring around the ink cartridge inside your pen! Like their name suggests, compression springs are designed with the unique ability to oppose compression, meaning that they push back when they are pushed on. Helically wound compression springs are the most common configuration of metal spring due to their extensive range of uses, but other configurations are available. Cylindrical compression springs are another common variety and are simply helical springs with pitch in between its coils. To serve their intended purpose, compression springs are either positioned over a rod or fitted into a hole. When the spring is subjected to pressure caused by weight pressing on its axis, it compresses and becoming shorter. As the spring compresses, it gains more and more strength to push back, much like a slingshot which will shoot with increased velocity as its band is pulled back further. This trait of compression springs is very valuable. In fact, since these powerful springs are designed to resist linear compression, they will push back harder and harder on whatever is compressing them in an effort to return to their original length. 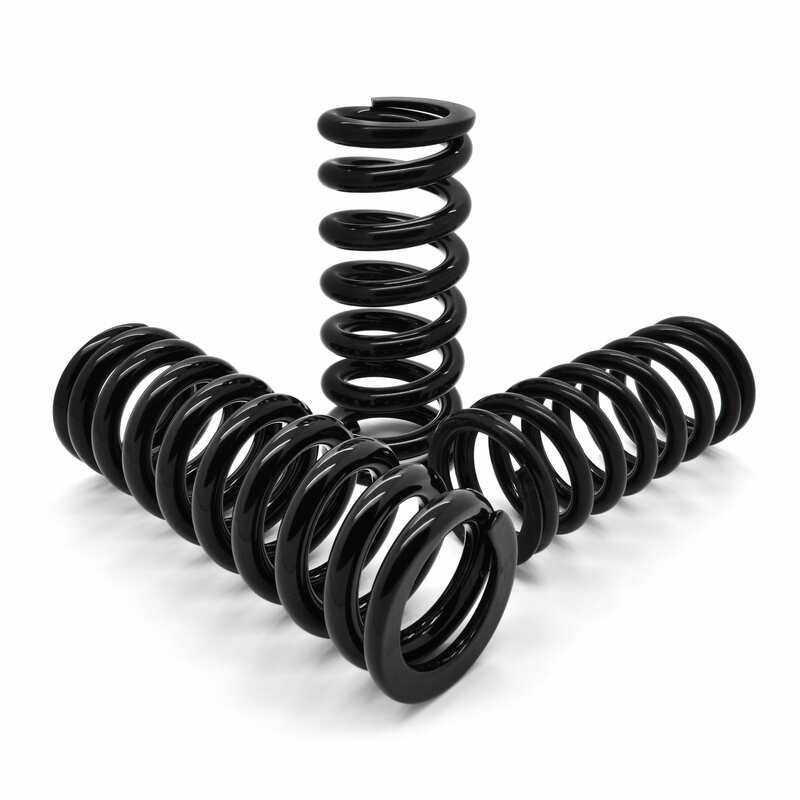 This force makes compression springs an excellent vessel for storing energy, therefore making this style of spring ideal for numerous applications. What Applications Require Compression Springs? Metal compression springs are everywhere! You wouldn’t know it, but these useful springs can be found in items you use every day like the engine in your vehicle, or even your cell phone. Since compression springs can be manufactured in nearly any size and with varying degrees of stiffness (also known as spring rate), they are an invaluable component in an extensive range of applications. Larger compression springs with greater spring rate are used in things like stamping presses in the printing industry, as well as large appliances and household equipment like lawn mowers. Smaller compression springs can be found in medical devices, small electronics, and precision instruments and tools. Put simply, stress and stress range are the two most important factors that determine how long spring will last, or in other terms, its “life.”Stress is determined by the spring’s dimensions as well as its load bearing and deflection requirements. When the compression spring is loaded or compressed as much as possible, the type of stress on the coil is referred to as torsion. Because the coil is compressed, the surface of the coil exposed to the pressure is subjected to the greatest stress, but as the spring begins to deflect, pushing back on whatever is compressing it, the rest of the spring begins to take on more of the stress, known as a range of operating stress. As explained by Spring-i-pedia, “The higher the stress range, the lower the maximum stress must be to obtain comparable life. Relatively high stresses may be used when the stress range is low or if the spring is subjected to static loads only. The stress at solid height must be high enough to permit presetting, yet low enough to avoid permanent damage since springs are often compressed solid during installation.” While stress and stress range might be difficult concepts to grasp at first, the experts at James Spring & Wire can help you take the guesswork out of choosing the right compression spring for your unique requirements. While the straight metal coil spring is definitely the most common and popular compression spring for numerous applications, there are other styles and configurations which serve different purposes. Unlike the straight metal coil spring, which has the same diameter for the entire length, compression springs can be found in different shapes like an hourglass which has a concave shape or conical and barrel which have a concave shape. In addition to different shapes, compression springs are available in wire sizes ranging from 0.005 up to .250, and with options for different configurations including open-ended, closed-ended, and combination ended. No matter what the specifications of your application, a custom compression spring can be manufactured to suit your needs. Contact James Spring today to get started!